Our pepperoni is delicately cob-smoked in the old fashion Vermont way over glowing corn cob embers in our smoke house located right here on our farm in Ferrisburgh. These fully cooked smoked sausages are delicious right from the package. The corn-cob smoke adds a sweet, mild smokiness that beautifully accents the peperonis natural flavor without over powering. 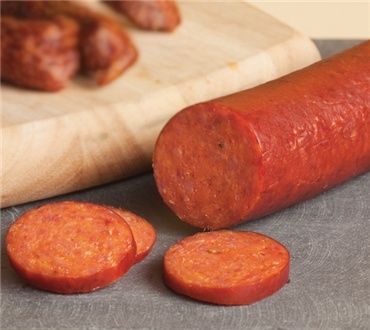 Our pepperoni is lean and has just the right amount of natural spice to add a balanced zing without being too spicy. Top your favorite pizza, spice up your next cheese plate, or slice and snack right out of the package, our pepperoni is the perfect way to add North Country zing to your favorite snacks or dishes. Each Stick weighs 7 oz. I just ate slices of it as it was well flavored and very tasty. My daughter frequently eats this with lunch. This is great on meat and cheese plates. It is also a great gift for others.